What makes a good bumble bee photo? There are many strategies for snapping photos of fast moving insects, but sometimes a helpful tip can be to wait at an open flower of a species attractive to bumble bees instead of trying to follow a bee around. This is especially true if you are using a smartphone, or point and shoot camera that is slow to respond after the shutter button is pressed. While some species can be identified from almost any photograph, there are some characters that are helpful to try and include in your photographs. In general, it is helpful to include multiple photos from different angles to give the best chance of a positive ID. 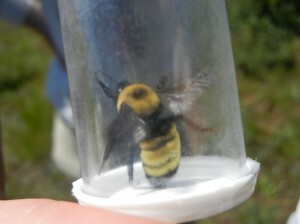 Below we provide specific recommendations, but please also check out our bumble bee anatomy page. Don’t be afraid to get close to bumble bees when they are visiting flowers. As long as you don’t touch them, you are very unlikely to get stung. Close-ups are the best photos as they allow the observer to see more detail! These two photos are of the same bee, but the photo on the left is taken from too far away! The photo on the right is taken from closer, and provides a better chance for identification. If your camera has one, use the macro setting (usually an icon of a flower)! This usually lets you focus on objects closer to the camera. Include photos from a few different angles. These will help you to see all of the characters on the bee. While the photo on the right is a good photo, adding the photo on the left allows the user to see the color on the face, a key character when identifying bumble bees. Try to include a shot that includes the face of the bumble bee. The coloration of the face can be important, but the structure of the face is often an essential character to verify submitted records. Cropping your photos before uploading them can also be an effective way to illuminate more detail. Cropping your photos before uploading may help you to see additional details. This is not necessary, but can be helpful. Putting a bee in a vial (they can often be captured directly into the vial from a flower) can be an effective way to snap some clear photos. If you are using a smart phone, another option is to take a video of the bumble bee and then extract images from the video file. There are numerous ways to do this, and a quick web search should lead you in the right direction. Don’t worry if you can’t ID the bee in your photo! Bumble bees can be tricky. Your photo submission will still help us keep track of bumble bee populations and it is quite possible that our experts may be able to ID your bumble bee. We carefully verify all of our photo submissions.